﻿﻿ Biography | Wake the Fork Up®! Gary Watson graduated from the University of Illinois (Urbana-Champaign) in May of 1992 with a B.S. in Kinesiology, and a correlate in Performance Nutrition. In addition, Gary took graduate courses in exercise and aging, the business of physical education, participated in a volunteer outreach program for adults, and was the president of the Illini Weightlifting Club. 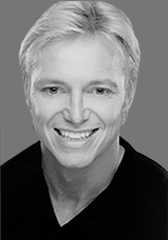 Gary began his career as a personal trainer at the world famous East Bank Club in Chicago. In November of 1992, he was Certified as a Strength and Conditioning Specialist (CSCS) through the well respected National Strength and Conditioning Association. He continues to stay current with all his continuing education requirements and holds a CSCS with Distinction status. In January 1995, Gary founded Gary Watson Training Systems and has had an extensive roster of clients ever since. Some of his specialties include; burning fat fast, conditioning for muscular strength and endurance, cardiovascular conditioning, nutrition and weight management, sport specific training, pre/post natal and post-rehabilitative programs. He quickly became one of Chicago’s most sought after trainers and consultants, mentoring other professionals in the field, and hasn’t looked back.